If you have a favorite set of tracks that you like to hear in a particular order and the tracks are in the Music library (or Video Library), you can build a playlist that gives you precisely what you want. It’s like being able to create your own, custom CD. 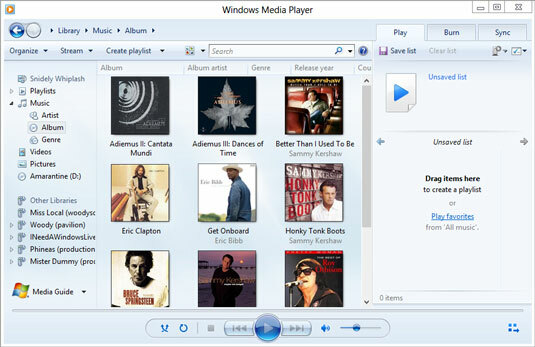 1In Windows Media Player, make sure that the Music library is showing (on the left edge). On the right, click the tab marked Play. 2If the Playlist area on the right has a bunch of music in it, click the Clear List link at the top of the Playlist area. 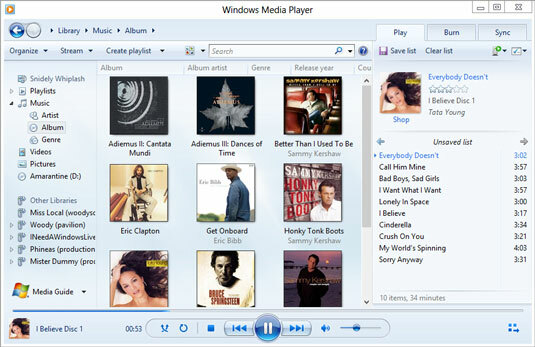 Windows Media Player invites you to drag items to create a new playlist. 3On the left, navigate to each song that you want to have on the playlist and then drag it to your preferred location on the right. You can use any of the navigation tools: Choose an artist, album, or genre, or use the Search box. Everything’s fair game. WMP adds the track to the playlist. 4If you decide that you don’t want a specific song on the playlist, right-click it and choose Remove from List. Click and drag a song to move it up or down in the playlist. 5When you’re happy with your playlist, click the Save List button at the top of the Playlist area. WMP highlights the Untitled Playlist text box, inviting you to type a name for the new playlist. 6Type a name for your new playlist in the Untitled Playlist text box and press Enter. WMP saves your new playlist. It appears anywhere playlists appear, anywhere in Windows Media Player. That’s how easy it is to create a new playlist. Note how Windows Media Player shows you the common decency of not arbitrarily rearranging the order of the songs.